The new plugin to connect with the software called “Epanet”, that allows the analysis of drinking water distribution systems, is now available in gvSIG 2.4. “Epanet” application is public and it’s developed by the United States Environmental Protection Agency (EPA). “Epanet” performs extended-period simulation of hydraulic and water-quality behavior within pressurized pipe networks and is designed to be “a research tool that improves our understanding of the movement and fate of drinking-water constituents within distribution systems”. 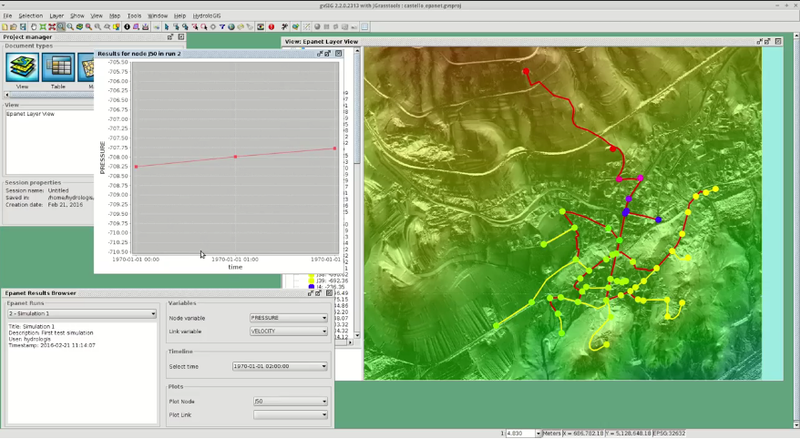 It provides an integrated environment for editing network input data, running hydraulic and water quality simulations, and viewing the results in a variety of formats. This helps to compute pumping energy and cost and then model various types of valves, including shutoffs, check pressure regulating and flow control. To download this plugin you have to open the “Add-ons manager” (from “Tools” menu) and select the “Installation by URL” option, connecting to the URL by default. At the next window you will select “Hydraulic” option at the list at the left side, and you will mark the only plugin available. Then you will accept the rest of the windows (if you didn’t have the base plugin it will be installed too) and after finishing you must restart gvSIG so that the changes have an effect. Once gvSIG is opened, you can access to the “HMachine” menu, where you will find the new submenu with all the options available. At these videos you can watch more information about this plugin: “gvSIG + Epanet: data preparation” and “gvSIG + Epanet: run epanet”. This entry was posted in development, english, gvSIG Desktop and tagged epanet, gvSIG 2.4, Horton Machine, Hydraulic, Water management. Bookmark the permalink.